It depends on the source as to exactly the number of days until NCAA College Football begins. I do not care as long as it begins. Here are some thoughts of what I am thinking as we wait anxiously for college kick off weekend. Why are Stanford and Rice playing in Australia? Will the Rice MOB play Tie e kangaroo down, Sport and jump around the field? Perhaps they will play Waltzing Matilda and waltz in formation. Will the Leland Stanford Jr. College Band be off of probation to attend? Is ESPN Game Day coming to College Station? Kirk Herbstreit, can ya’ll please come? I promise this year I will personally bring you barbecue from Fargo’s so I can meet you and take a selfie with all of you. Mr. Herbstreit and Mr. Howard, I would so love to have a photo of us doing a quarterback pose and the Heisman pose. I would like this because both of you are hotties and I am a 68 year old woman and can still do the poses and not fall over or break a hip. Mr. Fowler is pretty cute, but that Corso guy? Please do not let him photo bomb our pictures. Big 12 Conference! OU – we’re leaving. Oklahoma State – we’re going to win it. Kansas State – Snyder is still alive. Kansas – when does basketball season begin? Iowa State – why are you even in this conference? West Virginia – Can be spoilers to hopes, but I think Dana is cute. Texas Tech – Is this coaching seat hot or is it just me? TCU – Do these purple pants make me look fat? Yes, Patterson, they do. Baylor – praying for a resurrection in Waco. THE University of Texas – Hook ‘Em Hippies and it better be quickly. To the Saints of College Football – Saint Touchdown and any other saints that can help beat Alabama. The battery life of my flameless candle is four hours non stop. Please let the Texas Aggies play non stop flawless football for four hours. Don’t you just love my crafty candle? I know you all thought it was professionally made, but I did make it myself. You all know how crafty I am. Tequila shots and Poo Poo Undies Awards for Every college team except Alabama! What the hell – give the Tide a Poo Poo Undies Award for use later. I will also award Alabama and LSU The Manicure Award for being the only games that were not nail biters or heart attack givers. With Monday after comments, let’s begin. The Shoot Out at the OK (State) Corral. The Where’s Waldo – aka Rudolph? Where’s the ball? Where’s the Texas Defense? Look- I am a old woman who never played a down of football but who could catch a pass in that defensive strategy. PS – the ball is seen just above the 25 yard line. The Cowgirl and/or the Horse Could Have Kicked Better Award. Notice the rider does not wear a black mask or a cape like you know who. I guess these Cowboys do not need to hide their face. Thank you KK for such great pics and D for holding the paper. Go Pokes! The How to Kick Winning Field Goals Version 3.0 is awarded to Baylor University. Baylor 45 Iowa State 42 A three week Bye? That is right – only 10 teams in the Conference formerly known as The Big 12. The first Premature Celebration Award goes to Florida State University for scoring a go ahead touchdown with 23 seconds remaining in the game. FSU 35 UNC 34. The How to Kick Winning Field Goals Version 3.01 is awarded to University of North Carolina for kicking a 54 yard field goal as time expires. UNC 37 FSU 35. The Exploding Pumpkin Head for Coaches is shared – first by Bob Stoops from OU when the Cooper’s call went against the Sooners and then TCU’s Gary Patterson when the call was reversed. OU 52 TCU 46. The second Premature Celebration Award goes to Georgia for scoring on a Hail Mary pass with 10 seconds left in the game. Bulldogs 31 Tennessee Vols 28. The Hail Mary Joshua Fit the Final Battle of the SEC East Award goes to Joshua Dobbs and Jauan Jennings for the last play of the game. Tennessee 34 Georgia 31. Back to back successful Hail Mary passes! Where are my nitro glycerin pills? The Just When I thought I was Calm Award goes to Clemson and Louisville. The Longest Yard Award goes to Louisville for coming up one yard shy on Fourth Down as the time expires. Clemson 42 – Louisville – 36. Shake it off, Cardinals. I understand Cougar meat taste like Tiger meat. The No Let Up Award goes to Texas A&M and tu – not the tu orange that burnt up in Stillwater. It is the faded orange that resembles checkered table cloths washed in bleach. Tennessee is coming to town! 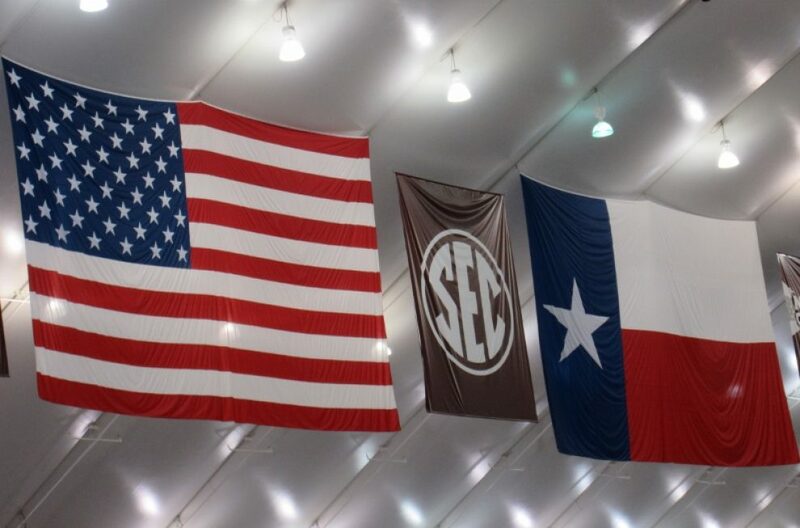 # 8 Texas Aggies and # 9 Tennessee Volunteers. 2:30 CBS Kyle Field Saturday, October 8, 2016. Note to non-football people – STAY AWAY from Bryan College Station probably officially beginning Thursday. This place is already going wild and crazy and it’s only Monday. WHOOP! Note to self: Check liquor supply. Ensure all calming drugs are up to date. And Who’s Cooper?